All transactions are safe and secure with a reliable history in online purchasing behind each of our associates. Buy the Dirty Dancing Baby in a Corner shirt to own Dirty Dancing clothing and merchandise. Snag this Nobody Puts Baby in a Corner t-shirt to remind everyone of one of the most unforgettable lines, let alone scenes, in movie history. Patrick Swayze and Jennifer Grey's chemistry is untouchable when he leads her up onto the stage and twirls her around. As her dress floats around her and her head gracefully flies back, you can only dream of being on that stage yourself. She's like the wind. Actually, any of our Dirty Dancing t-shirts will spark these memories for you and your friends. This tee is available in standard and long sleeve styles. Wear it when you visit the real Kellerman's resort. 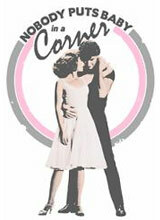 In addition to the Dirty Dancing Baby in a Corner tee above, browse the Dirty Dancing Clothing Gallery for more apparel like men's and women's clothes, kids shirts or hoodies.